This isn't the only restaurant with robots. We've seen that. However, this Japanese restaurant in Thailand has samurai garb wearing robots. With two locations in Thailand, Hajime features booths with touch-screen displays, which customers use to place their orders. 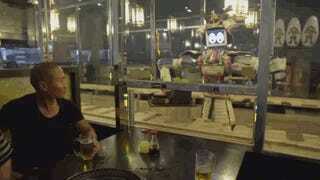 Then robots glide along a track in the middle of the restaurant and bring the food to the table. Drinks, however, must be brought by humans. There is a protective glass between the robot staff and the customers—probably in the event that the robots rise up. As Bangkok.com noted, when the robots aren't serving, they dance to Lady Gaga. The restaurant has been around for a few years now, but the video above was recently uploaded to YouTube and covered on Japanese website Pouch. The food does look pretty good. A big complaint, however, seems to be about the service—you know, that it's robotic.